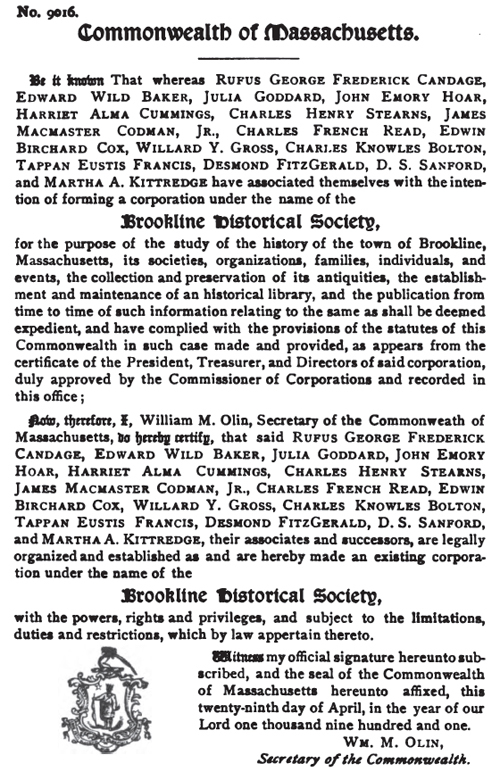 The twenty-first annual meeting of the Brookline Historical Society was held in the Edward Devotion House, Brookline, on January 26, 1922, at 8 p.m., President Charles H. Steams in the chair. I welcome you to this, our twenty-first anniversary; we are now of age, we have attained our majority, and we are here to celebrate the occasion, and to indulge in pleasing reminiscences of our youthful experience, and at the same time to take on the full responsibilities of manhood and womanhood. While our experience has been in the main a pleasing one, we cannot but recall our reasons for regret and sadness over the loss of many a faithful member and' friend who has helped us in our work and has passed on. Dr. J. Herbert Moore, died January 8, 1921. Mrs. Robert A. Boit, died February 18. George Frank Dearborn, died May 5. Mrs. Lucy M. Townsend, died June 13. Mrs. Eliza Tilden Goddard Watson, died September 28. Also Herbert Foster Otis, a former member, died March 24, 1921. Dr. J. Herbert Moore was known to very many of our citizens. He was born in Saco, Maine, and came to Brookline in 1885 or '86, a young man just from the medical school. He was of a most youthful appearance, so much so that people hesitated when employing him; but his constant application to his calling and his skill and kind attention to his patients gained him a large practice, and he died lamented by many friends. He lived for many years in the vicinity of Coolidge Comer, where he was widely known and respected, and removed only about two years ago to Williston Road, where he died in his sixtieth year. He had attended a number of our meetings, and was greatly interested. He was a strong, temperance man and always refused to use alcohol in his practice, except in extreme cases. Dr. Benjamin Seaver Blanchard was a physician widely known and loved. He was born in Roxbury, but had lived for the greater part of his life in Brookline. His home was on Washington Street at the comer of Greenough Street. He was sixty-four years old. Mrs. Lilian W. Boit, widow of Robert A. Boit, was born in New York City, and carne with her husband to her home on Colchester Street more than twenty-five years ago. She survived her husband but about a year, and was seventy years of age. 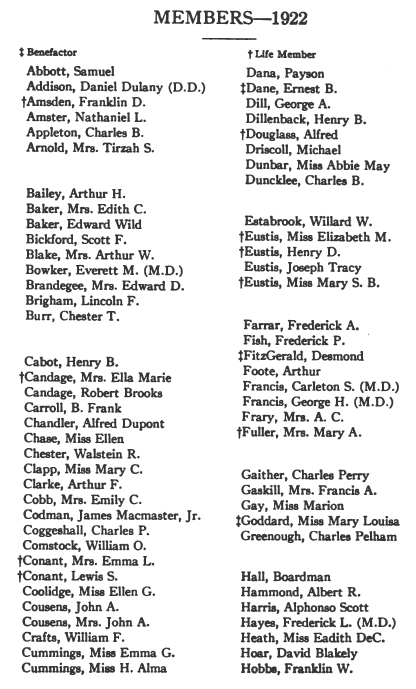 George Frank Dearborn was well known in Brookline, especially about Coolidge Comer. He was born in the town in a farmhouse which stood near the Allston line, on Harvard Street, but which was tom down many years ago. As a boy and young man he was employed in the old grocery store which was taken down to make room for the S. S. Pierce Company store. He afterwards enlisted in the Union Army in the Civil War. After his return he was appointed on the police force, and was promoted to a lieutenant, until he reached the age limit, retiring on a pension. He. lived in a small house on Park Street, directly in the rear of the Baptist Church. He was of a most genial nature, and one can hardly believe he could have an enE-.rny in the world. He was eighty years old. Mrs. Lucy M. Townsend of 9 Irving Street was born in Dover, Massachusetts, and carne to Brookline about twenty- five years ago. She was the widow of Dr. George J. Townsend, and will be kindly remembered by our members. She was regular in her attendance at our meetings as long as health permitted, and was much interested. She died at the age of seventy-nine years. Mrs. Eliza Tilden Goddard Watson was born in Brookline in the old historic Goddard home on Goddard Avenue, a daughter of Deacon Abijah Warren Goddard. Her youth was spent in Brookline, and later she married Mr. Watson of the firm of Churchill and Watson in Boston. For many years Mrs. Watson had lived with her daughter in the old home. She died in Boston at the age of eighty-three. Herbert Foster Otis was born in Boston and lived for many years on Holland Road, corner of Fisher Avenue. He also had a summer home in Nahant. Mr. Otis was not engaged in business, but was very fond of yachting. In his home he had many pictures of boats and ships, and he was familiarly called the Commodore of the Fisher Hill Yacht Club. He was of a kindly nature and fond of his friends. He was fifty-nine years of age. Outside of our society I note some of our prominent citizens who have passed away during the year. Horace L. Bearse of 673 Boylston Street came to Brookline about 1885. He was born in Hyannis and had a summer home on the Cape. He was a dealer in hardwood lumber of the firm of Owen Bearse and Son. He was sixty-five years old. James Love of Ackers Avenue, a native of Ireland, had lived most of his life in Brookline. He was a contractor, a hard-working, kindly man and most respected. He was eighty-three years old. Michael Duflley of Boylston Street, a native of Brookline, had always lived here. He was a plumber by trade, and for many years had served the town as an inspector of plumbing. He was widely known in the trade, and woe to the contractor who tried to get by the building and plumbing laws. He was a faithful servant of the town, and died at the age of sixty-three years. Mrs. Mary C. Olmsted was the widow of Frederick Law Olmsted, the celebrated landscape architect. She was born in New York City, but came to Brookline with her husband many years ago, they buying the old joshua Clark house on Warren Street, which they made into such a bower of beauty with its vines and plants. She lived to the good old age of ninety-one years. Munroe Goodspeed, born in Vermont, came to Brookline fifty-five years ago. His well-known livery stable opposite the Town Hall has been a landmark for many a year. His knowledge of and fondness for a horse was proverbial. He was seventy-eight years of age. Philip S. Allen, a formerly well-known contractor, was born in the town of jay, Maine, but came to Brookline in his early manhood and at first worked on the farm of Augustus Aspinwall on Aspinwall Hill. It is hard to believe that a farm existed on Aspinwall Hill (where the houses are So close together) within the memory of people living; but I can well remember the fine strawberry beds and rose gardens, as well as the vegetables there. Mr. Allen later went into the general contracting business and care of grounds, and will be well remembered by the older citizens of the town. He died at the home of his daughter. He was ninety-one years of age. Mrs. Florence P. Ver Planck was born in New York, but had lived 'for the past twenty years on Dean Road. She was the daughter of William P. Wellman, a former resident of Linden Place. Mrs. Ver Planck was one of the officers of the Friendly Society, and for a number of years was identified with its work. She was sixty years old. Mrs. Helen L. Hunneman, wife of William C. Hunneman of Colchester Street, was a daughter of Dexter C. Richards, a prominent Boston merchant, who bought the fine estate formerly owned by judge Wells. She was of a lovely character, and had brought up a fine family of boys, one at least of whom went across seas in the World War. She was a great invalid in her later years and died at the age of fifty-nine years. Mrs. Emily E. Shepard of Rawson Road, the widow of Otis Shepard, was born in Boston, but had lived in Brookline for thirty-two years. She died at eighty-eight years of age. Michael C. Lynch, the faithful caretaker of the estate of William I. Bowditch, had lived in the little cottage at the side of the road on Tappan Street for nearly fifty years. He was born in Ireland. He was eighty years old. Charles P. Ware was born in Cambridge, the son of Henry Ware, Jr., an eminent clergyman and a professor in Harvard Divinity School. Mr. Ware came to Brookline in 1872, later removing to Milton, and in 1895 built a house in Brookline on Allerton Street. He also had a summer home in Cataumet, where he died in his eighty-first year. For many years he had been vice-president of the Telephone ComPany, retiring automatically when he had reached the age limit. He was a delightful companion, quiet and retiring, but of infinite good nature and humor. His friends will ever remember his ready wit and his versatile knowled.ge. Mrs. Susan J. Sweetser, the widow of Frank E. Sweetser, was born in Portland, Maine. Her husband built the fine house at 37 Warren Street in 1897, and Mrs. Sweetser lived there until about five years ago, when she removed to Goddard A venue. ~he died at her summer home in Marion, sixty-one years of age. Nathaniel A. Francis, the eldest son of the well-beloved physician, Tappan E. Francis, was born in Brookline, and had always lived here. He was well known as a strong republican, and much interested in town affairs. He was fond of nature and. was quite an authority on bird lore. He was sixty-two at his death. Richard Henry Stearns was a partner in the well-known house of R. H. Steams & Co. He was born in Boston and built a fine house on Buckminster Road about ten years ago. He died in Lincoln, aged fifty-nine years. Rev. George L. Perin of Naples Road, the well-known clergyman, was born in Iowa. He came to Boston many years ago, and had a parish at the South End. He then came to Brookline and was the beloved minister of the Beacon Church. He was best known as the founder and president of the Franklin Square Home for working girls. Dr. Perin was also much interested in civic affairs, and for several years served on the board of School Committee. He died at sixty-seven years of age. Dr. Walter Channing and his wife, Anna M. Channing, died within a fortnight of each other at their home on Chestnut Hill Avenue. He was born in Concord, was a distinguished alienist, and more than forty years ago established the wellknown sanitarium on Boylston Street, the former home of Francis Fisher, who owned much of what is now known as Fisher Hill. Dr. Channing also owned a large tract of land in Dover, where he had intended eventually to remove his sanitarium. Mrs. Channing was born in Boston. She was a strong suffragist and had been very active in the movement. He was seventy-two years old and she seventy at their death. Charles R. Cross of Upland Road was a distinguished scientist, a graduate and life-long friend of the Massachusetts Institute of Technology, and one of its professors. He was especially interested in electricity, and was an authority on the Subject. He was born in Troy, New York, and had lived in Brookline for over thirty years. He was seventy-three. Thomas B. Griggs of Washington Street was born in Brookline and had always lived in the town. His father, Thomas Griggs, was a farmer and owned a large farm extending up Corey Hill and toward Harvard Street. Thomas B. Griggs followed his father's occupation and was very successful, only retiring when the growing city overleaped its boundaries and settled on the old farm. 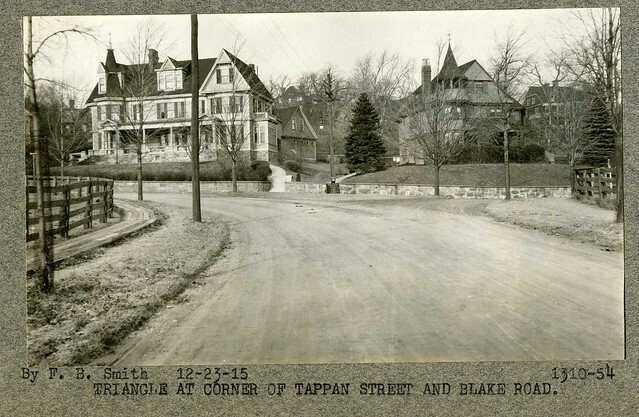 The widening of Beacon Street in 1887 took a large part of his land, but greatly increased the value of the remainder. Mr. Griggs, as his father before him, was a deacon in the Baptist Church, the elder having assisted in building the first meeting-house in 1828 at the corner of Harvard and Washington streets, and later in 1858 in the building of the second one at the corner of Harvard and Pierce streets. The son was greatly interested in the present stone church on Beacon and Park streets. He was interested in town affairs, but had never held any office; he was a Quiet, industrious and good citizen. He lived to the good old age of ninety-five. Harry W. Waite, also of Washington Street, was a son-in-Iaw of Mr. Griggs, living in the adjoining house, and dying. within a few months of his father. He was a dealer in metals, and had lived in Brookline for over thirty years. He was a town-meeting member and had served several times on "committees of thirty." . Mrs. Isabella B. Stodder of Walnut Street, though born in Roxbury, had early been identified in Brookline and lived here all her married life. She outlived her husband many years, and was over ninety when she died. Before her marriage she had been a school teacher, and was a well-educated and refined lady. She was well known to many of our people ..
John E. Peabody was born in Salem, and came to Brookline ten or twelve years ago, having built a beautiful home on Ivy Street in Longwood. He had retired from business and had served the town for a year or more on the board of Park Commissioners, succeeding George S. Baldwin, resigned. His age was sixty-eight years. Hiram H. Logan of Tappan Street was a successful merchant, a wholesale grocer. He was a native of Nova Scotia, but had lived in Boston and Brookline the greater part of his life. His death was Quite sudden, caused by a fall on the steps of his porch just as he was about to start on a summer trip. He was seventy-one years old. Louisa and Hiram were married in 1884 and lived at 143 Tappan Street. Louisa died in 1918 and Hiram married Agnes, his third wife, in 1919. Louisa's father had a school furniture company until his death in 1875. Hiram, as trustee for Louisa's mother and then Louisa (Shattuck), was the owner of the Shattuck property in Weston, including a house now called the Melone Homestead which is the subject of Ms. Bates' book. The Shattucks used half the house on a seasonal basis; the second unit housed workers at the school furniture factory and later, a dairy farmer and his wife. 143 Tappan St. to the left is still standing. Harriet Vass will be remembered as a florist who had a greenhouse near Cypress Street. She was born in England. She owned Quite a lot of land and, after giving up the flower business, had built several houses on the property and sold a number of house lots. She lived to be seventy-four. Mrs. Grace B. Washburn of Englewood Avenue, formerly of Druce Street, was knocked down by an automobile while crossing Beacon Street on November 3. She died shortly after in the Peter Bent Brigham hospital. She was of a lovable nature, a devoted member of the All Saints Church. Since writing the above, word has come of the death of John R. Poor of 1120 Beacon Street. He will be remembered as the lame gentleman who used to come to our meetings here, and was greatly interested. He was a lawyer, who came to Brookline in 1908. We have had four regular meetings, or rather three regular and one irregular. 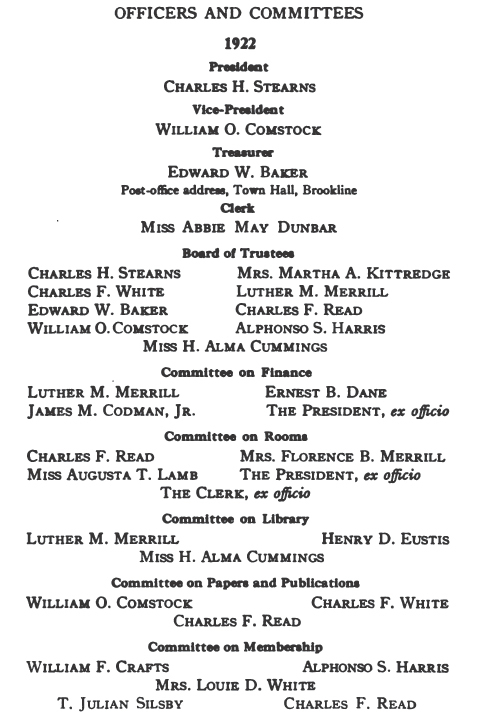 On Thursday evening, January 27, was held our annual meeting, at which reports for the year were read, officers elected, and the annual paper from the President read by Miss Alma Cummings, as the President was confined at home with a cold. Over twenty were present, and a very pleasant meeting was reported. On Tuesday evening, April 19, Charles F. Read read a paper by Edward W. McGlenen on the Ride of Paul Revere, illustrated by lantern slides. This paper gave details of the ride, a description of the roads he took, and gave views of the route and various houses that were standing at that time. It was a very interesting paper and was a fitting close of the holiday. The meeting was held in the hall of the Public Library and was well attended. Another interesting event of the holiday occurred earlier in the day when the gentleman personifying the messenger, Lieut. William Dawes, Jr., arrived at the Devotion School yard, accompanied by his retinue of riders. His reception this year was held out of doors, and a great crowd was in attendance. A pleasing incident of the occasion was a procession of boy scouts and girl scouts, who went through their manual and sang patriotic songs. The American Legion was also well represented, and its commander gave a fine talk. Speeches were made by several of our townsmen and by Mr. Dawes, and it was a very pleasant occasion and a most fitting way of celebrating 1 he day. 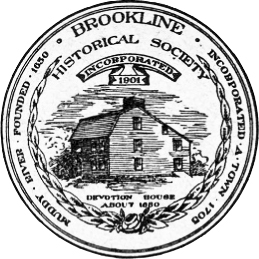 November 14 a meeting was held at the Devotion House to commemorate the two hundred and sixteenth anniversary of Brookline's birthday, November 13, 1705. Mr. Edward W. Baker, our treasurer, gave a most interes'ing paper about the "Beginnings of the Town." A goodly number of people were present and we had an enjoyable evening. I spoke about one of our meetings being an irregular one. It was railed for the evening of December 16, in the hall of the Public Library, and was to be addressed by Frank W. Bayley of Boston, on "John Singleton Copley and his Sitters," and was to be illustrated by lantern slides. Mr. Bayley was there promptly and so were his slides and the lantern, but the audience failed to appear. After waiting for some time after the appointed hour, and not more than twelve or fifteen people had gathered, Mr. Bayley took his slides and departed. It was very regrettable, for he was giving his services and had been at great pains in the preparation of his paper, and he felt it worthy of a larger gathering. The meeting had been well advertised and no fault could be laid to the officers of the society. 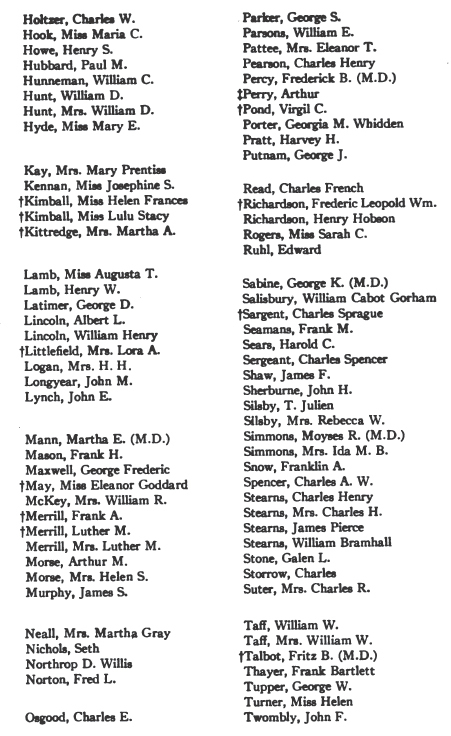 There have been three meetings of the Bay State Historical League, of which our society is a member. The winter meeting was held at the rooms of the New England Genealogical Society in Boston, at which Walter Kendall Watkins told us about many old Boston buildings, illustrated by lantern slides. The summer meeting was at Hingham. The exercises were held in the Parish House of the North Church, consisting of the election of officers, an address by the historian of the Hingham society, extolling the former residents of the town, and also a talk by the society's president, telling of the corning events of the tercentennary celebration at Plymouth. A bountiful lunch was served at the quaint quarters of the society, a former tavern. The fall meeting was at Plymouth. It was a beautiful day and a sight-seeing automobile had been chartered to take some of the delegates there, giving a charming ride. We were entertained at the headquarters of the Pilgrim Society, and the exercises were held in the Pilgrim Church. As Plymouth has been the Mecca of so many visitors during the past year, it is unnecessary to give any description of the great improvements going on there. In our town affairs there have been but few changes or events to record. Our inspector of buildings reports that during the year 1921 there have been 229 permits for new buildings, which, with alterations, amount to an estimated cost of nearly three and a half million dollars. Compared with 1920, a total of 128 buildings, which, with alterations, cost estimated about two and a half millions. It is interesting, however, to note that of the 229 permits, one hundred and forty-three were for garages, and only one for a three-apartment house, a type which eight or ten years ago comprised nearly all the new buildings. Among the alterations is one of a house on Washington Street near Greenough Street, which formerly belonged to the Blake estate, but which was originally built for Dr. Charles Wild. In the diary of Mr. Benjamin Goddard, extracts from which our treasurer, Edward W. Baker, read at one of our meetings, under the date of March 3, 1821, is this item: "Viewed with Dr. Wild, the farm of Mrs. Croft to assist in the selection of a building spot." This Croft or Craft farm was on the southerly side of Washington Street, taking in the estates of Desmond FitzGerald, Miss Kennan, and Dr. Blanchard, and probably this property, and extending back to about Davis Avenue. Mr. Samuel Craft was a very careful and particular fanner, his chief business being the raising and curing of seeds for planting. His home stood between Mr. FitzGerald's and Miss Kennan's. When the latter's father bought the land for his house, the Craft's house was bought by Thomas B. Griggs and moved to the other side of Washington Street, just west of Park Street, where it still stands. Dr. Charles Wild was one of our best-known citizens from the time he came to Brookline and built this house, one hundred years ago. For some years he was about the only doctor in the town, and was universally loved and respected. He was also greatly interested in town and parish affairs, and his name frequently appears in the town records as serving on committees. His son, Edward, followed his father's profession, and he, too, had the confidence and regard of the whole community. He was of a very impulsive and excitable nature, and at the time of the Crimean War, he (lately from the medical school) enlisted as a surgeon, and served with the British Army at the siege of Sevastopol. Later, when our Civil War broke out, he formed a company attached to the first Massachusetts Regiment. Later he was appointed a colonel in a colored regiment, and served until he was wounded and lost his arm. His portrait with its empty sleeve hangs in the hallway of the Public Library. Dr. Charles Wild left Brookline in 1859 or '60. The house probably was empty for a few years, but Mr. William Lincoln bought the place in 1886. Mr. Lincoln will be remembered by our older citizens. He served the town for many terms as assessor, and was highly respected. 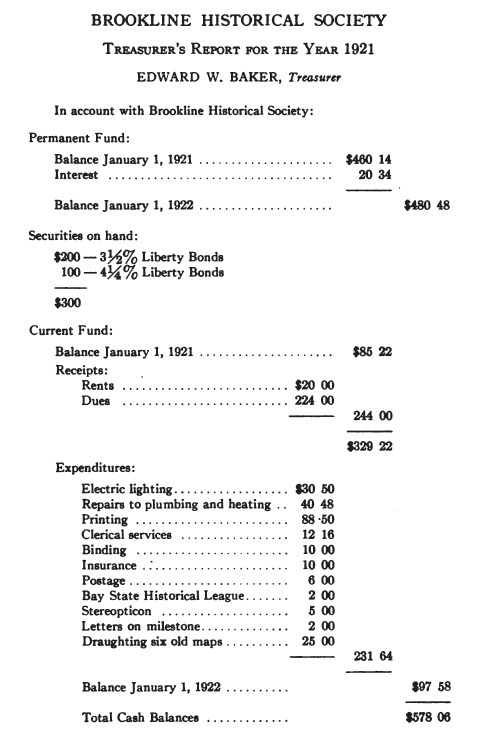 He was the father of William E. Lincoln, who was for so many years treasurer of the Brookline Savings Bank. Mr. Lincoln had business reverses soon after moving here and was forced to give up the place. Mr. Stephen D. Bennett bought it in 1869 and lived there for fourteen years, when he bought the house on Walnut Street known as the Bird estate and lived there until he died. The Blake estate was the next owner, and it had been in their possession until sold in 1916 to the proprietors of the Blake Park. Mr. William Whitman hired the place in 1884 and lived there until he bought his present beautiful and extensive estate on Goddard Avenue in 1894. Since then the house has been leased to various tenants, and showed signs of depreciation. Another house which is undergoing a change is the Benton house, which stood at the junction of Marion and Beacon streets, but which has been moved to its present location on Marion Street, and stores are being erected on the former site. Austin W. Benton built this house in 1860 or '61 and lived there for more than thirty years. He was quite prominent in town affairs, and had been on the board of assessors and also had served as school committee man. The house originally had quite an extensive frontage, but the widening of Beacon Street in 1887 cut a large slice off the land and left the house with a very limited front yard. As has been said, stores are to occupy the site. The wonder is where the business is coming from to make so many stores pay, for just below on Beacon Street, comer of Park, eleven stores have been built on what was known as the Hutchinson estate; six more have been erected on Beacon Street, comer of Carlton Street, and several on upper Harvard Street. An enormous garage has been built on the Ayer property near the Allston line; quite a number of single houses on Fisher Hill and Clark Road, and several two-family buildings in various parts of the town have been erected. The new Savings Bank on the site of the Guild store property in Brookline Village was begun last October, and begins fo show its fine proportions. The town has voted to build a large addition to the High School, but work has not yet begun. Mr. Newhall, who owns so much apartment property on Beacon Street, is building an immense structure of eight stories on the comer of Powell and Beacon streets. It is thoroughly built and fireproof, and will be a considerable addition to the assets of the town. The large estate on Harvard, comer of Babcock, has changed hands, the old house destroyed and foundations are being prepared for a block of stores with offices above. Harvard Street is destined to be a continuous line of business enterprises. Coolidge Corner continues to be a big center of trade, which will probably increase rather than decrease. A change of ownership of estates occurs in the south part of the town on Warren Street: the old house where Miss Julia Goddard lived has been sold, and many repairs and some changes made. Happily, the new owner has not attempted to make many alterations in the fine exterior, and the house presents about the same appearance to the passer-by. The changes, both exterior and interior, have been under the supervision of Henry Richardson Shepley, a grandson of the celebrated architect, H. H. Richardson, who was much interested in the old mansion. You will recall in Miss Goddard's charming paper written for our society, and which she had printed in a booklet entitled "The History of Green Hill," an item in which she speaks of the large fireplace in the kitchen, where she in her youthful days stood "watching and admiring the beautiful blaze of the wood fire." Probably later this fireplace had to give way to more modem ways of cooking, and was bricked up, and stoves took its place. Mr. Richardson has had the bricks removed and the original big fireplace restored. Another innovation - we all probably know the little old house in Brookline Village just east of Fleming's Garage, owned by the O'Dea family, but which in its original form was connected with a similar house which was tom down a few years ago. This was known as the Griggs-Downer house, a fine old estate with trees and a garden in front, on what was then a narrow road, and with the land sloping in the rear to a brook which used to flow into Muddy River, but which has been converted into' a sewer. In this house were some fine old doors, with delicate moldings, and these doors with the entrance door were bought of the present owner of the old house and used in the Goddard home. It certainly is a great satisfaction to have this fine old Goddard mansion, once the home of our old friend, thus preserved. It is reported that a large tract of land on Hammond Street and Woodland Road has been bought with the intention of erecting school buildings to accommodate the Beaver Country School, which is at present held in the Jonathan White estate on the comer of Sumner Road and Boylston Street. Coming back to our own quarters, we have to report some needed repairs to the outside of the house, new shingles and a coat of paint. The house has been used quite a little by meetings of various societies, mostly of a patriotic nature. A renewed effort must be made to obtain new members. It is a pity that our library is so little used, and though very small, it should be catalogued better, and I hope that our Committee on Rooms will consider this, and see what can be done to make it more attractive. I trust that we may have a successful year and that next year's paper may report quite an accession to our numbers.